Wow! This place is amazing. South Haven is absolutely deserving to be one of the nominees as the Best Lake Michigan Beach Town! The culture is totally Midwest small town. 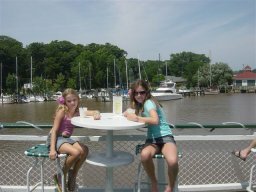 If there is one family activity that is enjoyed by all in South Haven, it has to be . . . walking. As a family we have walked almost every corner, and that is without tiring out our youngest too badly. Of course, the stops at our favorite places help break it up. Probably our all time favorite stop of all is the Idler. 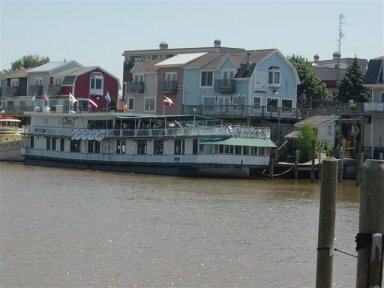 This is a large floating restaurant/bar that sits on the Black River not far from the inlet to Lake Michigan. We always sit on the deck with our various favorite beverages and watch the boats heading in from (or going out to) Lake Michigan. Dad likes the South Haven Iced Teas (adults only), Mom likes the shopping that surrounds the area, and the kids love the music and boats and all of the action going on around it. Here they are enjoying the Idler. Everyone is super friendly and the atmosphere is at all times festive. We would rank it as a must stop. 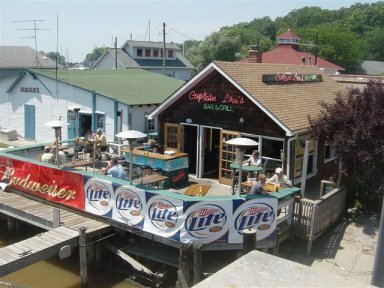 South Haven is full of great places to eat and drink; take a look at our Restaurant page to learn more. Here's a picture of one of the more lively nightspots in town . . . But of course a trip to a Lake Michigan Beach Town is not complete without venturing down to the Beach. Check out North Beach in South Haven! 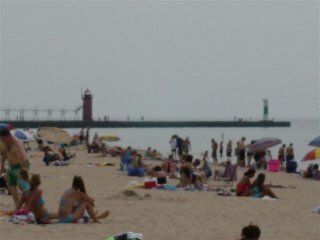 There are two main and very different beaches within South Haven. Our family likes both, probably because it is hard to find anything wrong with either one. Their names and location are pretty easy to remember as well; North Beach and South Beach. Be sure to check them out in our Beaches section. Our 3rd favorite thing to do in South Haven is shop. The shopping is exactly what you would expect in a resort town. All the essentials are readily available, plus plenty of beachwear and souvenirs. Need to find something in particular? Check out shopping. Check out Shopping in South Haven! South Haven is not a town that requires you rent right on the beach. For one thing, there is plenty to be said for renting a cottage with a view of the river. Besides, the whole town is within walking distance of one beach or the other. Since the South Haven experience is part beach, part river walk, part quaint town, you really can't go wrong with any of the cottages for rent, or the Bed and Breakfasts that are also perfectly located. The main points of interest to check out distances to are; North Beach, South Beach and downtown. These create a perfect triangle, with downtown being located directly between North and South Beach. If you are within blocks from one of these three you can be guaranteed a great vacation. And as always, our cottage rental listings page is the place to go to find great places to stay. As I mentioned, our whole family loves this town, so what are you waiting for? Visit, then write and tell us what you think!